Today I experimented a little with a breakfast bowl idea. I wanted to bake it in a soup bowl so I could have individual servings, or 2 smaller servings per bowl depending on appetites. I sprayed the inside of the soup bowls with cooking spray, then put all the ingredients in the bowl. I have to say it turned out very well. There is really more than enough for one hearty appetite or 2 smaller servings as I thought. The cheeses melted perfectly and the broccoli was just al dente and not too soft or overcooked. Preheat oven to 350 degrees. Spray a soup bowl with cooking spray. Whisk eggs and sour cream together and set aside. 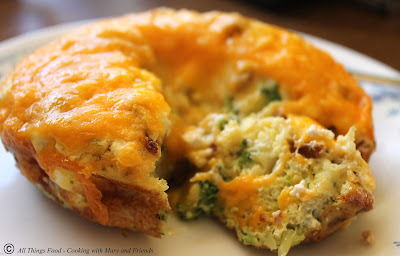 Place chopped broccoli, Swiss cheese and crumbled bacon in bowl. Top with egg and sour cream mixture, sprinkle with salt and pepper and top with shredded cheddar cheese. Bake 20 minutes or until eggs are set and cheese melted. Using a table knife, carefully loosen sides all around and lift breakfast bowl out with a small spatula. Serve immediately with a side of fresh fruit and your favorite beverage.